Term applied to the compilation of prayers and piyyuṭim; originally it designated the astronomical or yearly cycle. By the Sephardim it was used for a collection which contains the prayers for the whole year, while the Ashkenazim employed it exclusively for the prayer-book containing the festival ritual. The Maḥzor varies with the custom ( ) of the countries or cities in which it is used. Among the different European Maḥzorim the oldest is the "Maḥzor Romaniya," known also as "Ḥazzaniyya shel Romaniya," or "Grigos." It originated in the Byzantine empire (whence the name "Romaniya"), and differs from the Ashkenazic in that it contains fewer poetical compositions of Ḳalir. It was edited by Elijah ben Benjamin ha-Levi (who enriched it with poetical compositions of his own), and according to Zedner was published first at Venice, in the printing-office of Daniel Bomberg, and then at Constantinople (1573-1576). It is divided into two large volumes and contains, besides the prayers for the year and the piyyuṭim, the Five Scrolls, the Book of Job, the Haggadah of Passover, the beginnings and endings of the Sabbatical sections of the Pentateuch, and calendric rules. From the Byzantine empire the use of piyyuṭim was introduced into southern Italy, and thence into Rome. The Romans adopted some parts of the Maḥzor Romaniya, discarded others, and added much that was new, thus forming a new rite known by the name "Minhag Bene Roma," or "Minhag Lo'azim," or "Minhag Iṭalyani." The Roman ritual was widely disseminated from Rome, and after 1520 the Greek ritual was based upon the Roman Maḥzor, which served also as a basis for the rituals of Corfu and Kaffa. The Roman Maḥzor was published first at Soncino in 1485. Johanan Treves wrote a commentary on it under the title "Ḳimḥa de-Abishona," which was published, together with the text, at Bologna in 1540. An Italian translation of the Maḥzor was published at Bologna in 1538, at Vienna in 1823, and at Leghorn in 1837. The use of piyyuṭim was introduced into northern Europe probably from Italy. There, again, the Maḥzor underwent many changes, and a German ("Ashkenazi") ritual was established which is contained in the "Maḥzor Ashkenaz," the "Maḥzor Pehm [Bohemia] we-Polin [Poland]," and the "Minhag Ẓarfat" (="French ritual"). Of these the first two only are now in use. The French ritual was never published; it is extant partly in manuscript and partly in the ritual of the three Italian communities of Asti, Fassano, and Moncalvo, where many French Jews settled after their expulsion from France in 1306 and 1394. The several Maḥzorim included in the Ashkenazic ritual vary in some details, but agree in essentials. They are distinguished from those of other rituals in containing numerous piyyuṭim based upon the Halakah and Haggadah. The German ritual is used by the Jews in Germany, Bohemia, Moravia, or Silesia, Prussian Poland, Russia, Austria, Hungary, France, and England. The Ashkenazic Maḥzor was first published about 1521, the Polish in 1522. 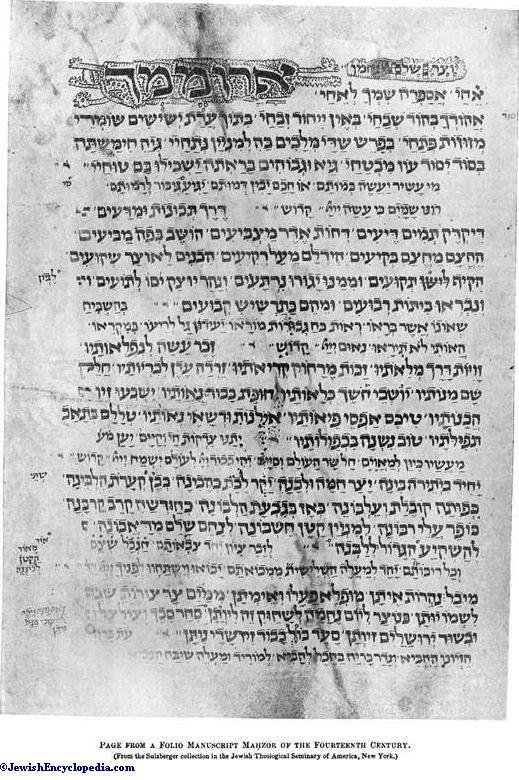 Among the commentaries on the German and Polish Maḥzor, which have often been published together with the text, are those of: Benjamin ben Meïr ha-Levi of Nuremberg (Tanhausen, 1540), Isaac ben Jacob Jozebel (entitled "Hadrat Ḳodesh," Venice, 1554), an anonymous writer (entitled "Ma'agle Ẓedeḳ," Venice, 1568), Ẓebi Hirsch Zundels (Lublin, 1579), Nathan Shapira (Cracow, 1604), Joseph Bezaleel Kaẓ Meḥoḳeḳ (Prague, 1616), a second anonymous writer (with additions entitled "Sefer ha-Masbir," by Joseph , and with glosses and notes entitled "Masbir he-Ḥadash," by Moses Kosmann, Amsterdam, 1667), Hirz Shatz (Wilhelmsdorf, 1673), Benjamin Wolf Heidenheim (Rödelheim, 1800), Uri Feibus ben Aryeh Löb (entitled "Ḳeri'e Mo'ed," Breslau, 1805), Moses Israel Büdinger (Metz, 1817), and Jehiel Michael ha-Levi (entitled "Maṭṭeh Lewi," Slobuta, 1827). Translations of parts of the German Maḥzor into the vernacular of the countries in which they were used began to be made as early as the fourteenth century. In 1571 Abigdor ben Moses published a Judæo-German translation of the Maḥzor for New-Year and the Day of Atonement. In 1600 the Judæo-German translation of the whole Maḥzor was published by Meïr Anshel ben Joseph Mordecai of Posen. 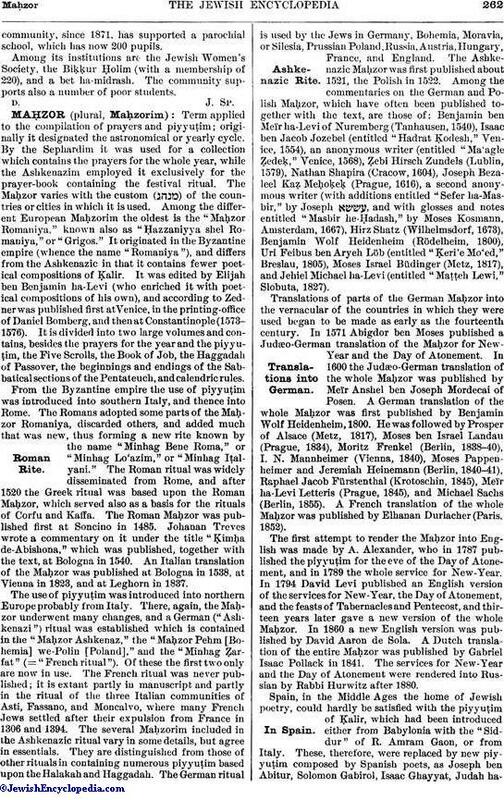 A German translation of the whole Maḥzor was first published by Benjamin Wolf Heidenheim, 1800. He was followed by Prosper of Alsace (Metz, 1817), Moses ben Israel Landau (Prague, 1834), Moritz Frenkel (Berlin, 1838-40), I. N. Mannheimer (Vienna, 1840), Moses Pappenheimer and Jeremiah Heinemann (Berlin, 1840-41), Raphael Jacob Fürstenthal (Krotoschin, 1845), Meïr ha-Levi Letteris (Prague, 1845), and Michael Sachs (Berlin, 1855). A French translation of the whole Maḥzor was published by Elhanan Durlacher (Paris, 1852). The first attempt to render the Maḥzor into English was made by A. Alexander, who in 1787 published the piyyuṭim for the eve of the Day of Atonement, and in 1789 the whole service for New-Year. In 1794 David Levi published an English version of the services for New-Year, the Day of Atonement, and the feasts of Tabernacles and Pentecost, and thirteen years later gave a new version of the whole Maḥzor. In 1860 a new English version was published by David Aaron de Sola. A Dutch translation of the entire Maḥzor was published by Gabriel Isaac Pollack in 1841. The services for New-Year and the Day of Atonement were rendered into Russian by Rabbi Hurwitz after 1880. Page from a Folio Manuscript Maḥzor of the Fourteenth Century. Spain, in the Middle Ages the home of Jewish poetry, could hardly be satisfied with the piyyuṭim of Ḳalir, which had been introduced either from Babylonia with the "Siddur" of R. Amram Gaon, or from Italy. These, therefore, were replaced by new piyyuṭim composed by Spanish poets, as Joseph ben Abitur, Solomon Gabirol, Isaac Ghayyat, Judah ha-Levi, and Abraham and Moses ibn Ezra. Indeed, the number of piyyuḥim composed by Spanish poets was so great that almost every Spanish city had its own ritual. After the Spanish exile the same ritual was adopted by all the Sephardim with the exception of the Catalonian and Aragonian congregations of Salonica, which still use their old Maḥzor for New-Year and the Day of Atonement. The Maḥzor of the Sephardic ritual was first published at Venice in 1614. As representing distinct branches of the Sephardic ritual may be regarded: the Tripoli Maḥzor for New-Year and the Day of Atonement (published first at Venice in 1648, under the title "Sifte Renanot"); the Maḥzor of Tunis (published at Pisa); the Maḥzor of Algiers ("Minhag Algaza'ir," published first at Amsterdam in 1685); and the maḥzorim of Provence and Languedoc, four of which are still extant—those of Avignon, Carpentras, Cavaillon, and Montpellier. Many piyyuṭim of the Sephardim were incorporated into the Maḥzor of northern France, and some of them entered the German Maḥzor. 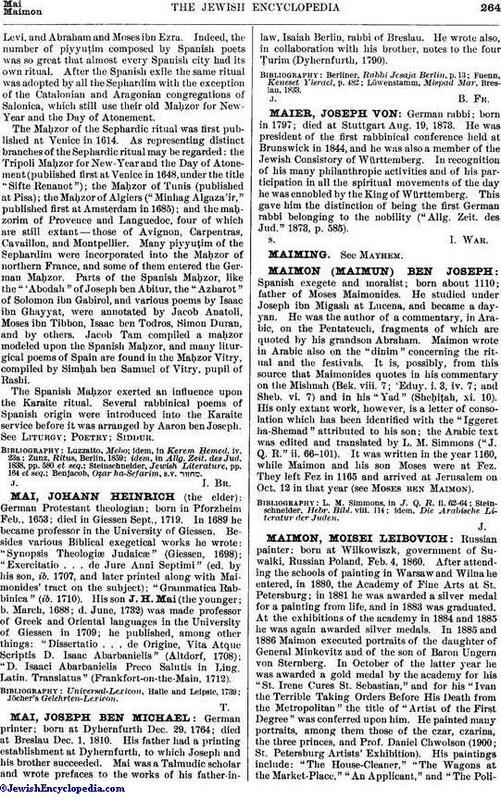 Parts of the Spanish Maḥzor, like the "'Abodah" of Joseph ben Abitur, the "Azharot" of Solomon ibn Gabirol, and various poems by Isaac ibn Ghayyat, were annotated by Jacob Anatoli, Moses ibn Tibbon, Isaac ben Todros, Simon Duran, and by others. 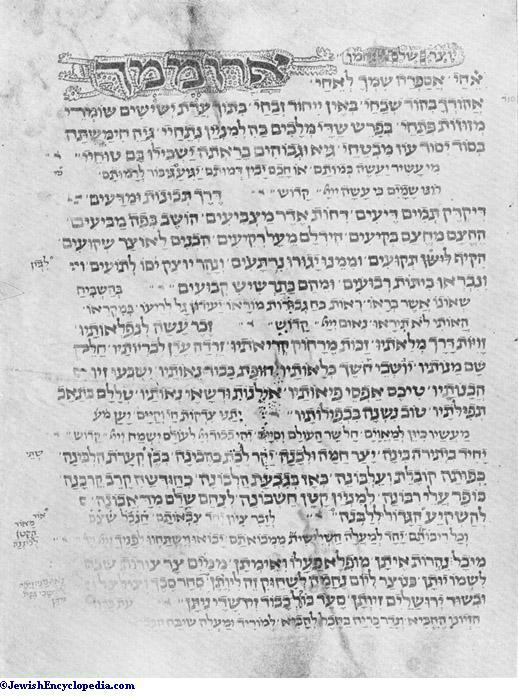 Jacob Tam compiled a maḥzor modeled upon the Spanish Maḥzor, and many liturgical poems of Spain are found in the Maḥzor Vitry, compiled by Simḥah ben Samuel of Vitry, pupil of Rashi. The Spanish Maḥzor exerted an influence upon the Karaite ritual. Several rabbinical poems of Spanish origin were introduced into the Karaite service before it was arranged by Aaron ben Joseph. See Liturgy; Poetry; Siddur.